The 2016 GHSA Girls Track and Field State Championships featured four DeKalb County teams finished in the Top 10 of their respective classifications and four individuals claiming gold medals in five events last weekend at Hugh Mills Stadium in Albany. Cedar Grove was one of two teams to finish in the Top 5 of their classification scoring 32.50 points in Class 3A competition trailing 2016 state champ Maynard Jackson (62.20). The Lady Saints were led by Amani Taylor who captured gold in the discus with a throw of 123 feet, 9 inches to score 10 of the 14 points she put on the board for Cedar Grove. Taylor was fifth in the shot put (35-06.00). McNair had a Top 15 finish at No. 13 with 16 points behind a pair of silver medals from Ashanti Johnson in the 100 meter dash (12.326) and the 200 meter dash (25.06). The Tucker Lady Tigers also picked up a Top 5 finish with 38 points good for fifth overall in the Class 6A state meet. Freshman Kaylah Lumsden scored 13 points for Tucker with 10 coming from a gold medal performance in the 100 meter dash with a time of 11.74. She was 6th in the 200 (24.55). Emoni Coleman put up 12 points for Tucker with a silver medal in the 800 meter run (2:11.44) and a fifth place finish in the 1600 meter run (5:03.16). Lakeside finished tied for 28th overall with four points coming from Alaina Smith’s two seventh place finishes in the 1600 and 3200 meter runs. McEachern won the Class 6A title with 69 points. The Chamblee Lady Bulldogs finished in a tie for sixth with Hampton with 28.50 points in the Class 4A state meet. Monroe of Albany was first with 81 points to take the title. Chamblee’s Top 10 finish was fueled by a silver medal by the 4×100 relay team with a time of 46.91 and a silver medal by Venida Fagan in the 400 meter dash (54.53). 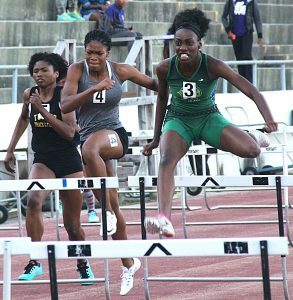 Arabia Mountain finished just out of the Top 10 in 11th place with 22 points led by Destinee Rocker’s gold medal performance in the 100 meter hurdles with a time of 14.11. Jazmine Johnson added to the Lady Rams total with six points via a silver medal performance in the shot put. Redan was 16th with 17 points led by a pair of fourth place finishes from Tanzanie’ Brown in the high jump (5-02.00) and the 800 meter run (2:22.20). Cross Keys picked up three points to finish tie for 32nd overall. Vanesa Rubio-Toxtle finished 6th in the 1600 meter run (5:21.05) to score the points for Cross Keys. The Stephenson Lady Jaguars were the fourth DCSD girls’ track team to put together a Top 10 finish with 21 points in the Class 5A State meet good for 10th behind state champ North Springs’ 50 points. The Lady Jaguars got 20 of their points from field event specialist Timberly Molden who collected a pair of gold medals last week. Molden won the discus with a throw of 132 feet, 11 inches and the shot put with a toss of 43 feet, 8.5 inches to propel Stephenson into the Top 10. Dunwoody and Druid Hills were in a three-way tie for 25th with Allatoona with eight points. Ansley Heavern scored seven of the eight points for Dunwoody behind a bronze medal finish in the 1600 meter run (5:10.47). Druid Hills’ points came from fifth place finishes in the 100 meter dash by Keaghan Peppers (12.01) and Airian Riddick in the discus (123-10.00). Martin Luther King finished in a five-way tie for 28th with six points with all of them coming in the 300 meter hurdles from Taleebah Martin in fifth (45.50) and Courtney Franklin in seventh (45.89). Miller Grove was in a tie for 48th by picking up a point in the 4×400 meter relay.